Niwot Ridge (an hour and a bit away from Boulder, Colorado), has a long history of scientific research dating back at least 50 years. 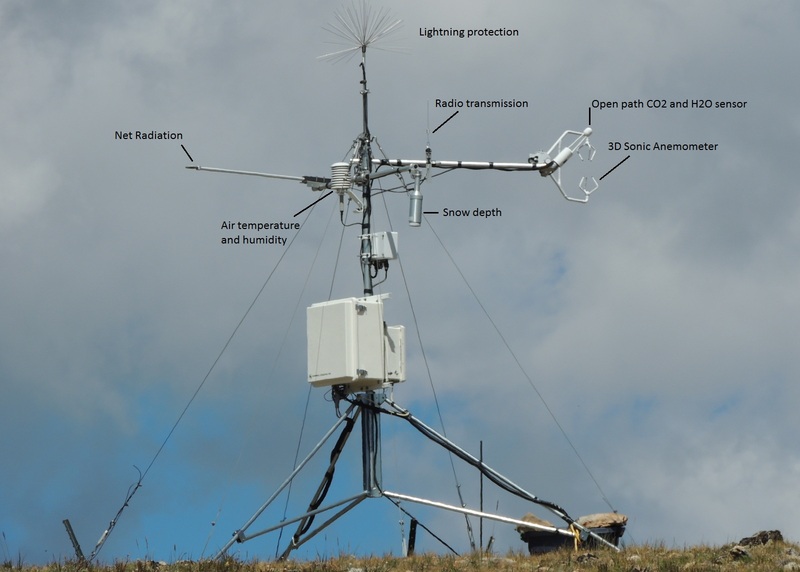 Today various entities such as the University of Colorado, which includes the Long Term Ecological Research (LTER) netrwork, NOAA, NEON and NRCS have observing equipment in the area. The ridge spans a range of ecotones, from forest up to alpine tundra. NCAR's Terrestrial Sciences Section and associated researches such as myself went up to Niwot to check out some of the data sources used for developing and improving the Community Land Model. The flux tower, DFIR precipitation gauge and associated apparatus belonging to the National Ecological Observing Network (NEON). Inside the University of Colorado's "Tundra Lab". Sean exploring local hydrology heterogeneity in the tundra zone. The large Ameriflux Tower at the Niwot forest site. Sensible heat, latent heat and carbon fluxes are measured at various levels, both above and below the forest canopy. The equipment in this shed is used to record the isotopic ratios of carbon measured on the flux tower. Rosie explaining how sap flow measurements work using heat flow meters (i.e. two spikes driven into the tree). John discusses a number of snow measurements taking place within the forest. 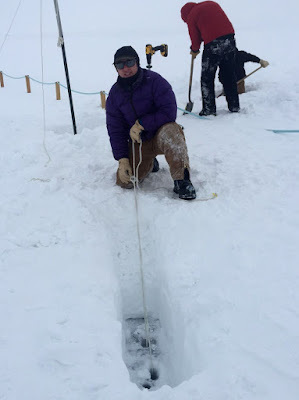 These include measurements of snow depth in relation to trees as well as experimental systems for quantifying interception of snow by the canopy. Justin, John & Danica at the Niwot Ridge SNOTEL station during the snow-free season. The large item in the center of the picture is the pressure transducer pillow that measures snow water equivalent (SWE). Permafrost, ground that is continually below 0C for two or more years, is a notable feature of the Arctic. The CRREL Permafrost Tunnel (drilled into a hillside) is a virtual time machine where ancient vegetation and fossils from long extinct animals can be easily seen entombed in the frozen ground. Ice wedges with an age of over a hundred thousand years are another amazing feature to be seen. Next stop for the day was the Super-Site flux tower which has been operated by IARC for over five years. This tower measures the energy, mass and carbon balance of a Black Spruce forest and aims to distinguish how much the upper canopy and understory vegetation each contribute to various fluxes. A final stop was made at a section of the Trans-Alaska Pipeline System. This engineering feat transports oil all the way from the Arctic Ocean, across a full North-South transect of Alaska, to the port of Valdez on the Pacific Ocean. The pipeline. The vertical silver items are cooling fins that form part of a thermosiphon (a device for keeping the adjacent ground cool so that permafrost does not thaw and damage the pipeline). Over my years of research I've probably visited University of Alaska, Fairbanks (UAF) more than any other campus - and I'm back again to help teach the IARC (International Arctic Research Center) Summer School (I also taught at the school in 2013). A diverse group of very bright graduate students and early career scientist have come up to IARC at UAF to learn about Earth System Modeling with an emphasis on the Arctic. Student backgrounds range from permafrost to sea ice to biogeochemical cycling and beyond. On the first evening Vladimir, who has been running the Summer Schools for well over a decade, organized a BBQ. Antarctica is a notoriously windy place. The windiest place on Earth is said to be Commonwealth Bay, Antarctica, where winds often exceed 240km/h (150mph) and the average wind speed is 80km/h (50mph). The cold dense air that forms high on the Antarctic plateau can rush down to the coast at tremendous speeds under the force of gravity; these are known as Katabatic Winds. On the night of 17th Sept. the peak gust at McMurdo was 67.5 knots (125km/h, 78mph). Wind carries particles (aerosols) and blows snow around so it is an important quantity for us to measure. We are using two instrument for measurement; a traditional cup anemometer on our weather station and a sophisticated sonic anemometer. The "sonic" measures the travel time of pulsed sound waves, which will speed up if assisted by wind - it can measure wind speed and direction up to 20 time a second (20 Hz). Our weather station, with cup anemometer, at Zodiac Camp. A faint solar halo can be seen around the sun; this is caused by light refracting off ice crystals high in the atmosphere. Aligning cable to the sonic anemometer has to be done very carefully; we have to lay cables out quickly while still they are still warm as the very cold temperatures makes some cables brittle and they will shatter if moved too much afterwards. Doug drilling anchor holes while Lars and Mike "supervise" and fine tune their shovel leaning technique. It was a very pleasant -20C/-2F during this installation so none of us are wearing our big jackets. 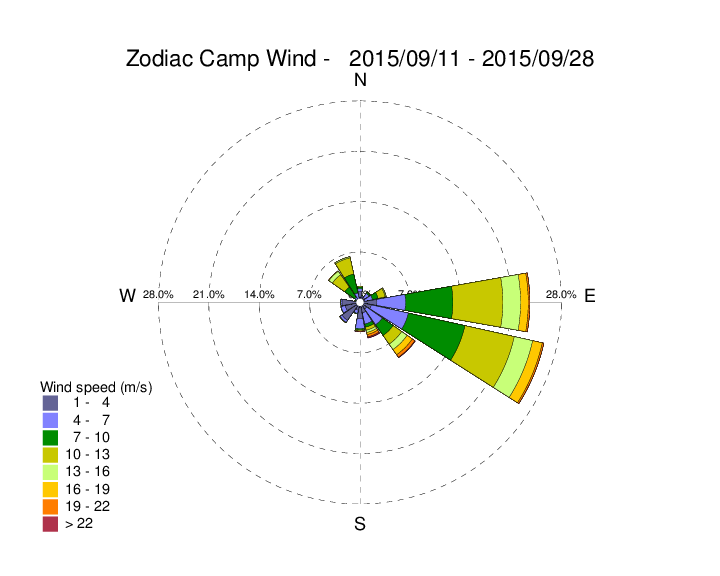 The wind rose from Zodiac Camp for 17 days of the campaign. The dominant southerly winds of Antarctica are wrapped around Mt Erebus on Ross Island to hit our camp from the east and south-east. 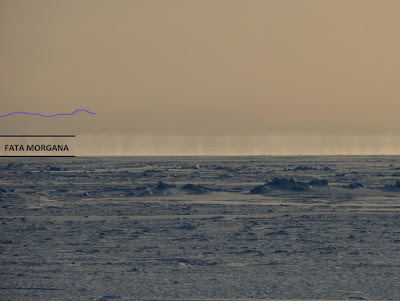 We have chosen the camp location carefully so that we are sampling clean air and are not downwind of McMurdo Station. The maximum wind speed at Zodiac Camp was 31.3 m/s (70mph, 61kts, 113km/h). There are only four (4) science groups at McMurdo during WINFLY. It is a very friendly atmosphere among the science teams as everyone understands the difficulty of working in Antarctica. Radio chatter will often be about conditions near various science camps or observations that could be relevant to each others projects... and the opportunity to poke fun at another team is rarely missed. Last Sunday we car-pooled (matt-track-pooled?) with members of team B-017 who work on understanding how seals navigate (see previous blog entry about B-017). They invited us for "chips and dip" at their camps... though this isn't what you may be thinking - it refers to using an ice chipping bar and a dip net. Lars dip netting ice out of a seal breathing hole in order to keep it open and unfrozen. The plastic tube directs warmer air blown from the top of the tent down towards the hole in an effort to minimize refreezing. Chipper bars (left) that are used to maintain a breathing hole. The "cookie" is designed to plug up a hole. Lars (black) and Traci (red) had been shoveling ice out of this hole. Traci and Jason put the cookie in the hole. Another group working in our vicinity is B-134, who study Antarctic Invertebrates. We rendezvoused with them out near the edge of the sea ice one evening as we were searching for frost flowers. Kevin (L) and Gretchen (R) of B-134 carry their samples back to their PistenBully. It's not a particularly good photo because all cameras were freezing up in the cold temperatures and there was not enough time to adjust exposure before the camera died. Frozen cameras are just one challenge of working in Antarctica. Team B-259, aka SIMPLE, work close to the McMurdo Ice Shelf which is quite a way from the other teams. They are putting a robotic sensor under the ice shelf to investigate the sub-ice ecosystem. I don't have any photos of SIMPLE in the field, but their team played a great set at the Carpenter Shop Party on Saturday, which signifies the end of WINFLY and start of Main Body at McMurdo. Antarctica is the coldest, highest and driest continent in the world. It is largely a desert, with most places receiving less than 250mm of water equivalent each year. Despite low precipitation, snow is often mobile at this time of year (September) due to unsettled weather, very cold temperatures and some very high wind speed events. The interplay of wind speed and snow surface conditions create many patterns in the snow as the battle between snow deposition and erosion takes place. Surface forms in snow can be similar to those in sand, but an important difference is that snow crystals will sinter and bond with each other, meaning that some erosion derived forms, such as sastrugi, are only found in snow. The rate of bonding is a function of temperature, so in the cold of Antarctica snow can remains mobile longer than more temperate snow climates. Anondo collecting samples among the drifting snow. Patterns of wind affected snow. The whole photo is about 30cm (1ft) across. The sound of snow in Antarctica. The main point of interest in this video is the sound of my boots walking across the very cold, dry and well packed snow - the snow crystals are crushing or grinding against each other. It sounds (and feels) a bit like styrofoam. Small sastrugi, created by erosion, can be seen in the foreground. Mt Erebus is in the background. This post is inspired by recent work from colleagues in Alaska (Filhol & Sturm, 2015). Polar regions can produce some interesting optical effects due to extreme temperatures and/or low sun angles. Yesterday was beautifully calm at Zodiac Camp and an inversion formed (i.e. when air closer to the surface is colder than the air above it - normally air temperatures decrease with altitude). The colder, denser air near the surface has a higher refractive index compared to the warmer (though still cold) and less dense air above it. The difference in refractive index acts like a lens, bending light. Yesterday's inversion produced a Fata Morgana; a phenomenon where, to the observer, an image of the underlying surface is mirrored in the air above it. 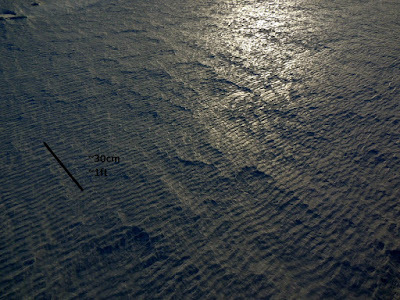 Often it looks like the horizon line is stretched. 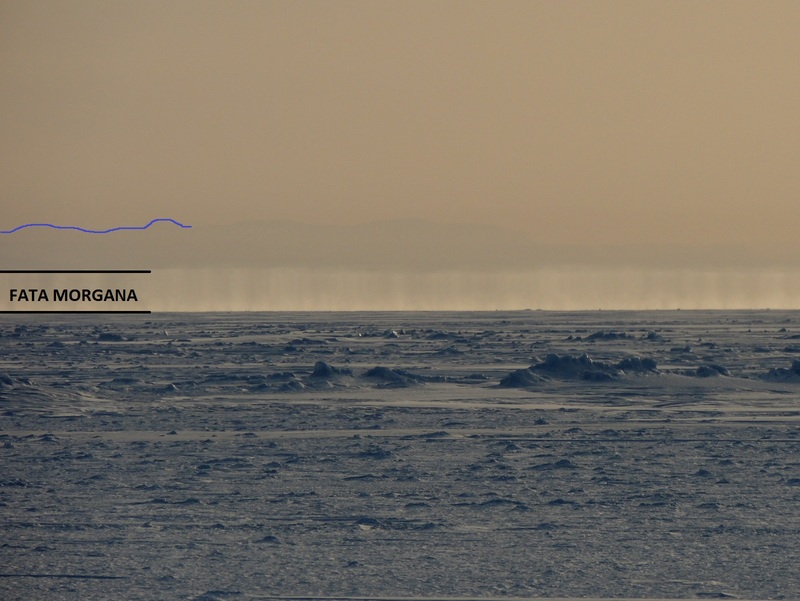 The Fata Morgana can be seen as a white bar (probably as a result of the underling snow and sea ice) on the horizon. The blue line give a partial outline of the faintly visible Royal Society Range of mountain. 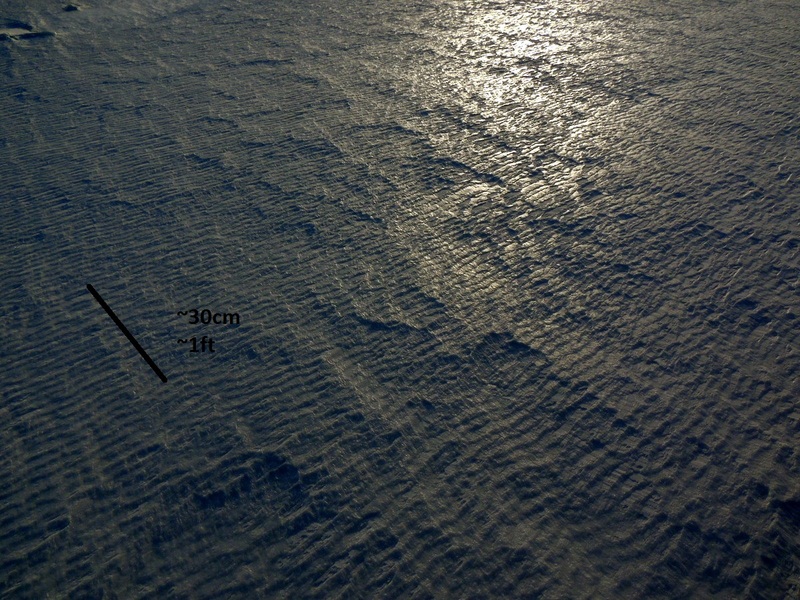 The weather in Antarctica is notoriously fickle. It can be sunny with glorious views of glaciers, ice sheets and mountains, but within an hour a raging storm may engulf you in a white-out. A white-out is just that - blowing snow and winds mean that all you see is a white void and having any sense of direction can be extremely difficult. Many research sites (including ours) are located on the barren white landscape of the sea ice - yes, we are driving over the ocean! A white-out poses a serious travel risk so all main routes to research sites on the sea ice are set with flags spaced at 25m (~80ft). This is a time consuming, but very important, process. A ground blizzard en route to Zodiac Camp. The flag in the top left corner is only 25m away, but can barely be seen. 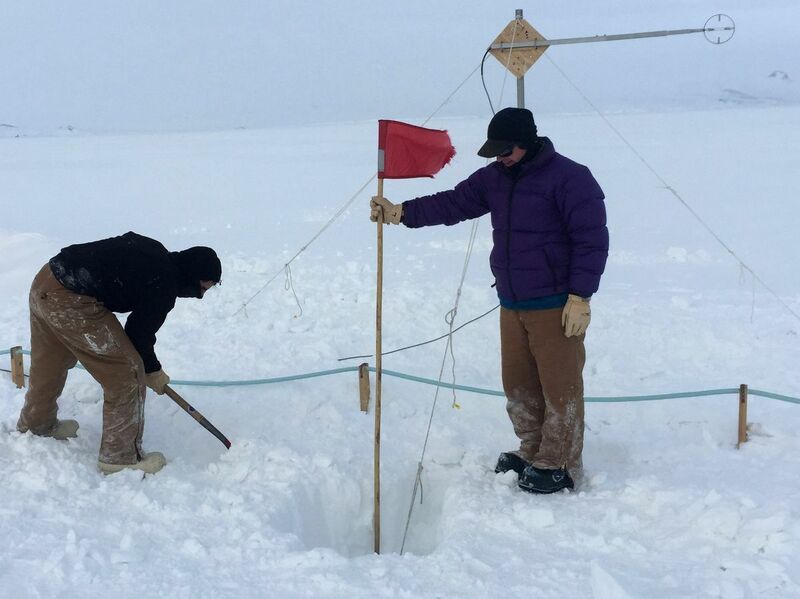 To set a flag line, we use a Kovacs Ice Auger and drill holes using either a battery powered drill, or a gas/petrol powered drill (called the Echo drill) or some good old muscle with a brace-and-bit. Lars runs the Echo drill, while Doug readies the flags. The Turkey-tail of flags marking the turn off to Zodiac Camp. Lars drilled all the way through the sea ice at this location. The ice was 2m (6.5ft) thick.